This week’s post is not really on automation, or anything technical. A couple of days ago I visited a local plant at the invitation of a consultant who is working with their management team to improve their processes. While this consultant is adept at efficiency, workflow and other Lean topics, he is not an expert at automation, so he came to me for some advice. We discussed several possible simple projects to move material around, quite simple stuff really, but probably projects that this company couldn’t do in-house or even with the machine shop down the street. Anyway, when we were done they mentioned a couple of little sensor and control issues they had, and I said I’d like to take a look. The first thing I noticed was that the sensors were quite old, as was much of the hardware on the control panel. When I opened the control panel I saw an image similar to that at the top of this post. There were wire nuts and loose wires everywhere, making the panel look like an afterthought. Upon discussing the history of some of this equipment I learned that a local integrator/controls type guy had been helping them for a long time, and he had put this equipment in years before. He was mostly retired now, and they were waiting for him to come in and advise them on how they could fix or replace the sensor. He didn’t seem to have much interest in coming in and helping them. This brought back a lot of old memories from my past life as a controls integrator in East Tennessee. There are lots of older factories with equipment like this, and varying degrees of maintenance capability. There are also a lot of panels and wiring jobs just like this. When I went outside to leave, I mentioned the state of the equipment to the consultant. 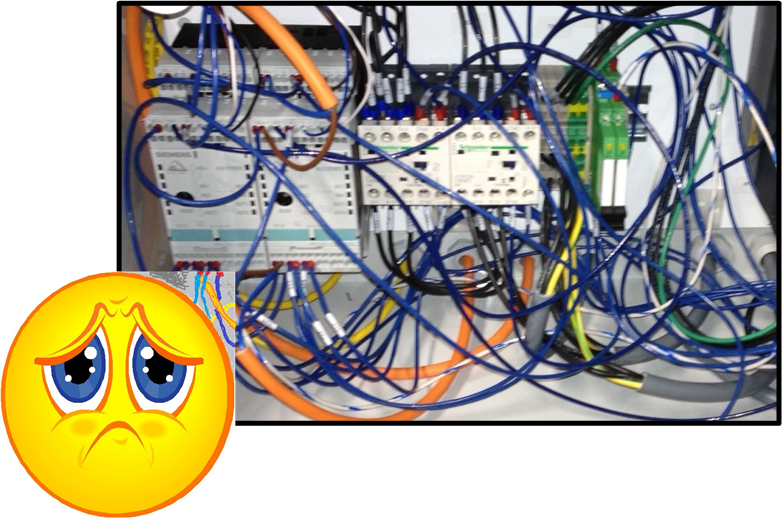 I said that if they had a young maintenance guy that was new and just learning the plant, this would be a great opportunity to show some love to the equipment; rewire and document everything, label and organize the wiring. The response I got made me as sad as the face in the image above. He said “they won’t do that, they don’t see it as adding value”. Unfortunately, I see this as a cultural problem. There doesn’t seem to be much pride taken in work any more in a lot of places. Nobody is even looking at the equipment unless it breaks down. Companies are out to squeeze every last dollar out of their processes, but aren’t taking care of their equipment or their people. There seems to be no motivation to love their jobs or their hardware as they would something that belonged to them. I believe this attitude bleeds over into employee’s lives when they aren’t at work also. There are people who would do anything to have a job that gives them the opportunity to learn, practice and make money at the same time, but it seems that most people can’t wait to get out of work and kick back. I love my job and the field I have chosen. I have passed through a lot of different phases of my career, from apprenticing to maintenance, to being a technician, then an engineer, to running a company with employees that depended on my decisions, and now finally to teaching others. I realize not everybody has the same opportunities and interest in what they are doing, but to me it is so important to take pride and responsibility for your job. So show some love to your automation. It’s sad and waiting for some attention.